Section Headings - a full list of contents is available from the Publisher on request. Part I. Connexin (2 papers, 5 contributors). Part II. Development of gap junctions (7 papers, 27 contributors). Part III. Gastric mucosa and gap junctions (4 papers, 16 contributors). Part IV. Carcinogenesis and gap junctions (16 papers, 76 contributors). Part V. Cardiac muscles and gap junctions (14 papers, 67 contributors). Part VI. Nervous system and gap junctions (10 papers, 32 contributors). Part VII. Gland function and gap junctions (8 papers, 30 contributors). Part VIII. Assembly of gap junctions (4 papers, 12 contributors). Part IX. Expression and regulation of gap junctions (8 papers, 39 contributors). Part X. Gap junctions expressed in oocytes (6 papers, 20 contributors). Part XI. Gating and conductance change of gap junctions (11 papers, 41 contributors). Index. 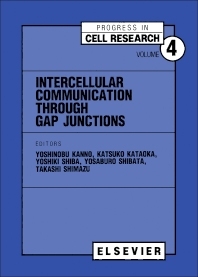 Research on intercellular communication through gap junctions has continued to expand, and the meeting on which this book is based brought together many scientists from many different countries and disciplines. In line with the objective of the meeting, this volume focuses on the biological meaning of intercellular communication through gap junctions in various organs. The most recent up-to-date findings have been included in this extensive volume, valuable to all those interested in this rapidly expanding field.